Three friends, Chris, Jeff, and Marc, go shopping for shoes. The store is having a buy two pairs, get one pair free sale. 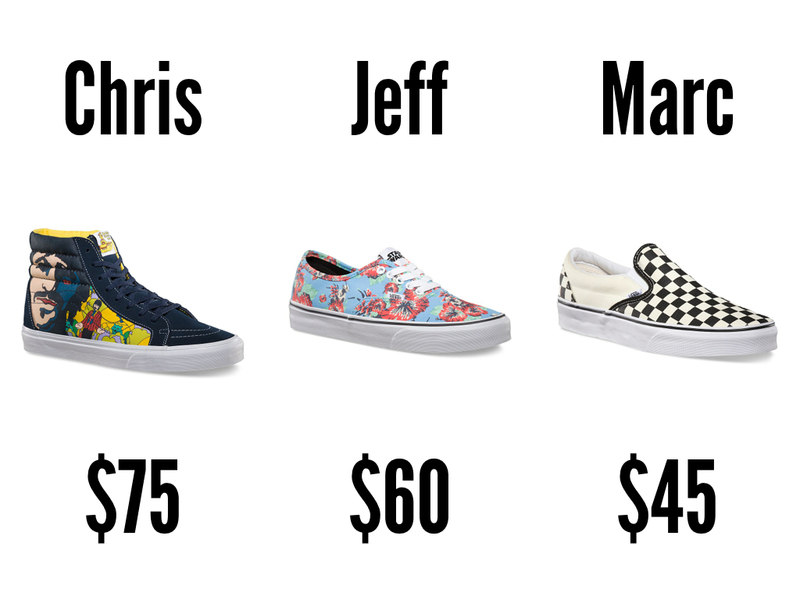 Chris opts for a pair of high tops for $75, Jeff picks out a pair of low tops for $60, and Marc settles on a pair of slip-ons for $45. The cashier rings them up; the bill is $135. How much should each friend pay? Try to find the fairest way possible. Justify your reasoning. I had a chance to test drive this task in a Math 9 class. I asked students to solve the problem in small groups and record their possible solutions on large whiteboards. Later, each student recorded his or her fairest share of them all on a piece of paper. If you’re more interested in sample student responses than my reflections, scroll down. Next, most groups landed on $60-$45-$30. 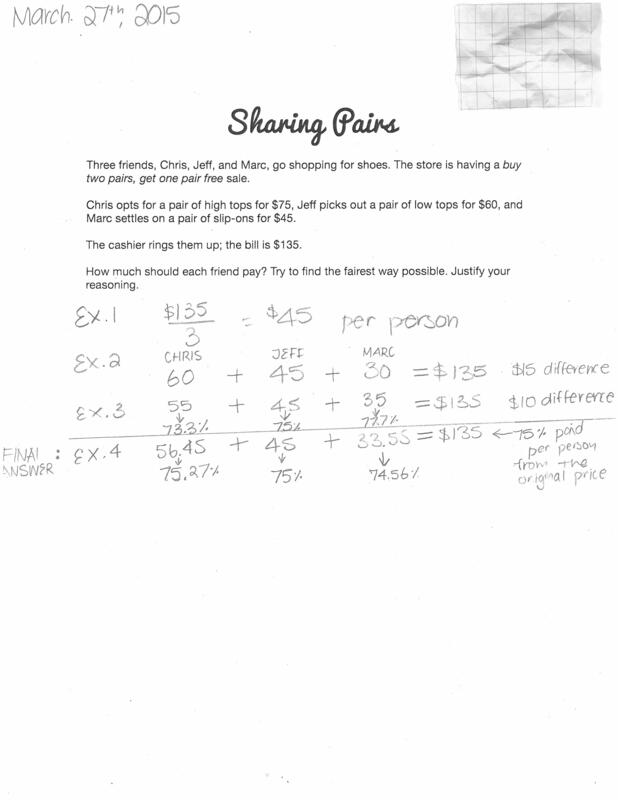 Some, like Student A, shifted from equal shares of the cost to equal shares of the discount; from ($180 − $45)/3 to $45/3. Others, like Students B, C, and D, arrived there via a common difference; in both $75, $60, $45 and $60, $45, $30, the amounts differ by $15. This approach surprised me. 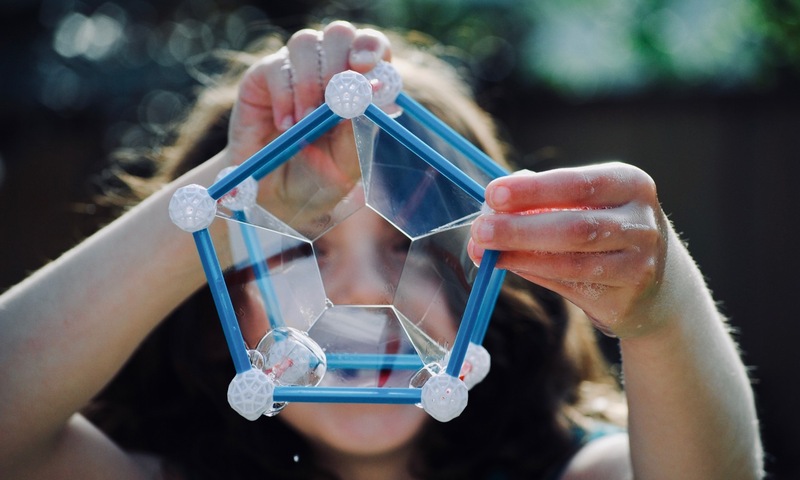 Additive, rather than multiplicative, thinking. Student C noticed that this discount of $15 represented different fractions of the original prices; $15/$75 = 1/5, $15/$60 = 1/4, $15/$45 = 1/3. He applied a discount of 1/4 to all three because “it’s the middle fraction.” Likely, this is a misconception that didn’t get in the way of a reasonable solution. Student D presented similar amounts. Note the interplay of additive and multiplicative thinking. She wants to keep a common difference, but changes it to $10 to better match the friends’ discounts as percents. In spite of not reaching my learning goal, I think that this lesson was a success. The task was accessible yet challenging, allowed students to make and justify decisions, and promoted mathematical discourse. Or, I could make changes to my questioning. Maybe I could ask “What else could you say about the prices of Chris’ shoes compared to Marc’s?” etc. to prompt comparisons involving ratios. If that fails, I’m more comfortable connecting ratios to the approaches taken by students themselves than I am forcing it. 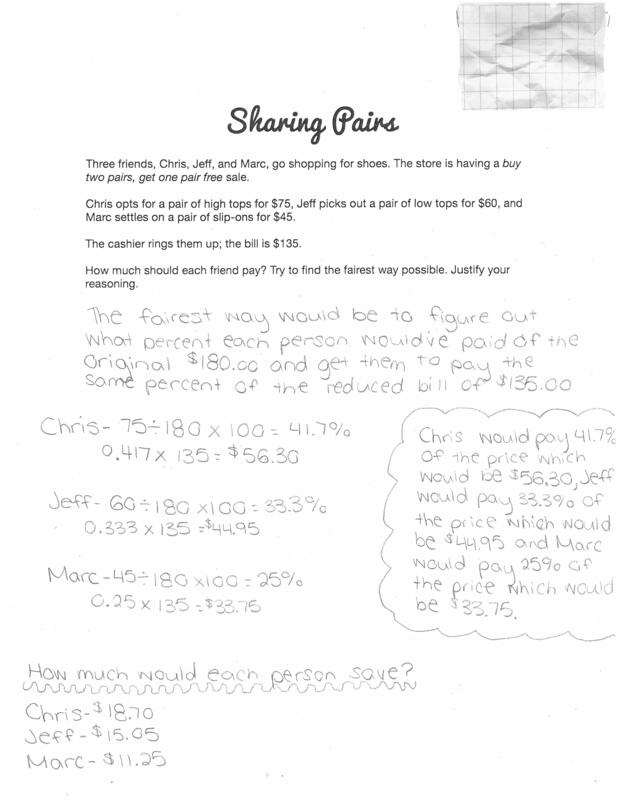 BTW, “buy one, get one 50% off” vs. “buy two, get one free” would make a decent “Would you rather?” math task. Thanks for sharing this rich task, and for the link to Peter Lillijedahl’s site. What a treasure trove! I had not come across it before. I was with you, completely nodding along, until I got to your comment: “in spite of this, I think this lesson was a success.” What?! This lesson was awesome, no caveats needed. I needed to re-read a couple times to see why you weren’t satisfied. I was ecstatic when I found Peter Liljedahls activities and have done several of them at home, though none in school yet. As you found, they always lead to discussion of many different ways to divide fairly. Sometimes there is also a more engineering-oriented discussion of practically how to divide when we are dividing something that is hard to cut accurately. If you wanted to take this conversation farther, you could encourage the kids to talk about how the different splits compared, what feels more or less fair (and for whom) and why they feel that way? Note: saying that a split is fair because Chris pays more than Jeff who pays more than Marc doesn’t cut it because all the proposed splits had that feature. 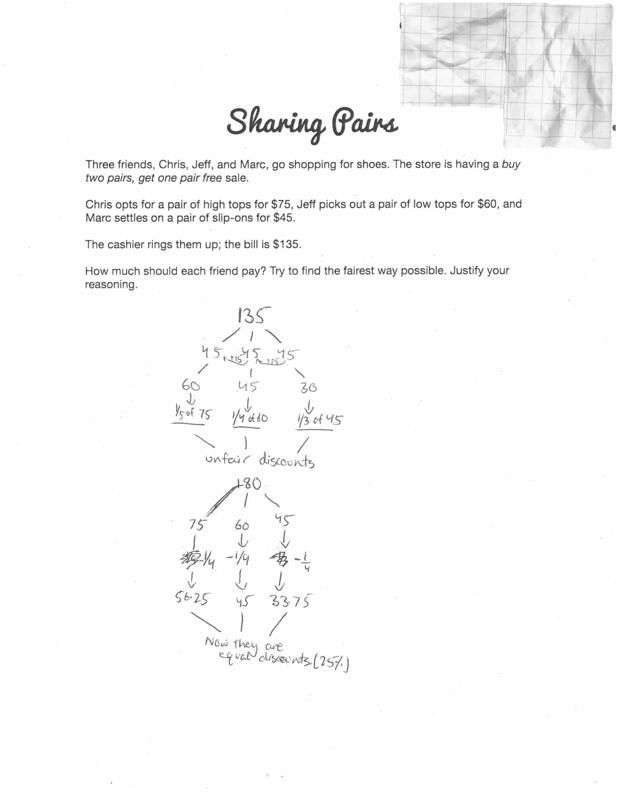 Getting into the game theory of it is also interesting, for example: given an algorithm for splitting the bill, would any of the kids want to change their shoe selection? Also, have any of these kids been in this type of situation before? I don’t know how old Math 9 kids are, but I would guess they have and could share some comments about what happened or how their behavior changed. You’re right. That was awkward. I edited the post to read “in spite of not reaching my learning goal” rather than “in spite of this.” Can a lesson be considered a success if it misses the learning goal? Probably. I don’t know if these kids (age 14) have experienced this situation. Shoulda asked. I really love this task and plan to use it in my 8th grade classroom. 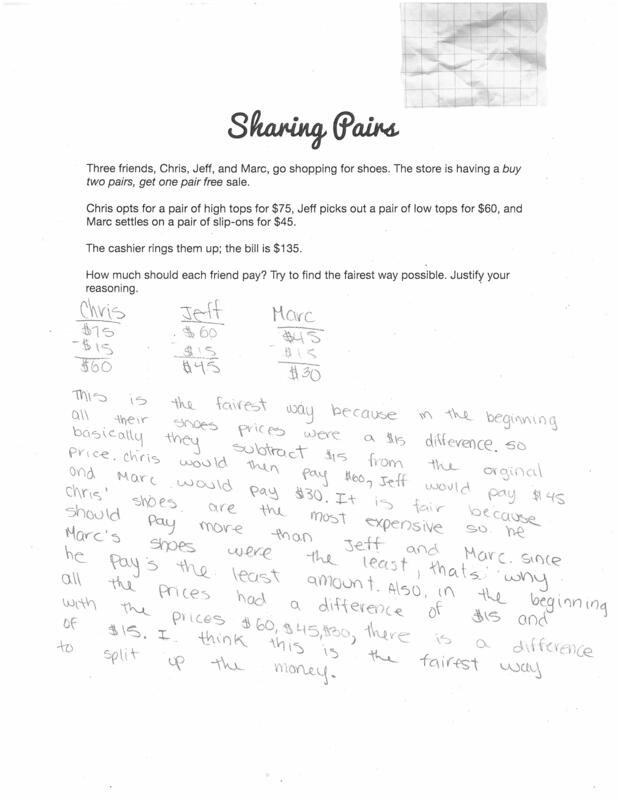 I attended your talk at NCTM, and I remember that you suggested using different dollar amounts in order to make the conclusion more clear for students as to why simply dividing by three was not fair. Would you be able to remind me what those new suggested amounts are? I’m hoping to use the task as a way to assess student discourse. My plan is to have them work independently first to determine their answer and then discuss with others. I think using the new dollar amounts that make the conclusion more obvious will be really helpful for the discussion. Thanks for attending my session, Brad. When I got a do-over with this lesson, I changed the prices to $150, $90, and $60. 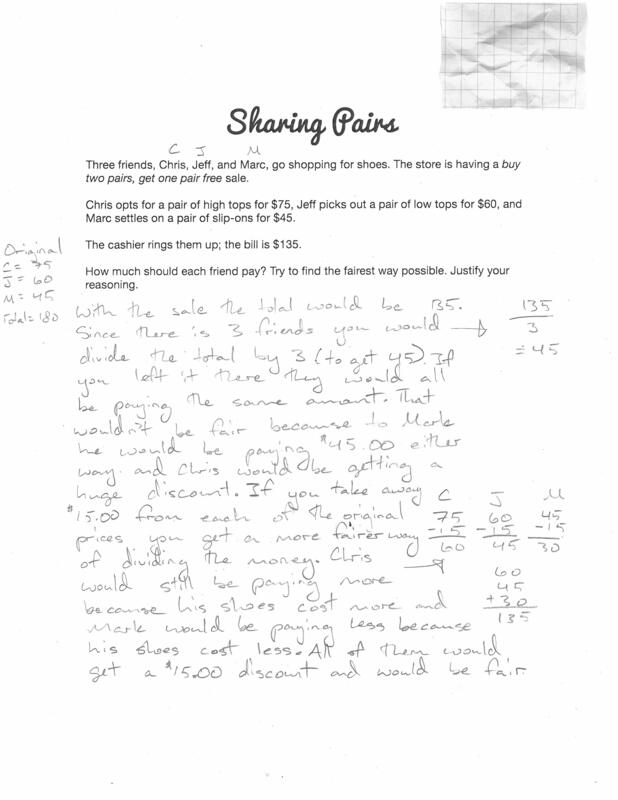 Even with the original prices of $75, $60, and $45, students pick up that dividing the total by three isn’t fair (although Marc paying $80 for a $60 pair of shoes makes this even more obvious). The new prices allowed students to better pick up that dividing the discount (in dollars!) isn’t necessarily fair. When I displayed the prices and asked, “What do you notice?” students said, “Chris’ shoes are half the total/the same as Jeff & Marc combined.” So when Chris pays $130 of $240 in that “let’s split the $60 discount evenly” scenario, it creates some tension with their initial observation that his shoes are worth half the total. This often led to another sharing strategy that involved fractions/percents/proportions where my first choice of numbers did not (without some serious hinting from me). Let me know how it goes.